(Press Unit in the Office of the Prime Minister) – Deputy Prime Minister and Minister of Sports, the Honourable Shawn Richards, was among the dozens who visited the Robert L Bradshaw International Airport on Tuesday, April 3 to warmly welcome the Federation’s athletes home after a successful campaign at the 2018 FLOW CARIFTA Games in the Bahamas over the Easter weekend. The St. Kitts and Nevis athletes, led by Team Manager, Mr. Denville Francis, captured four medals over the Easter weekend. 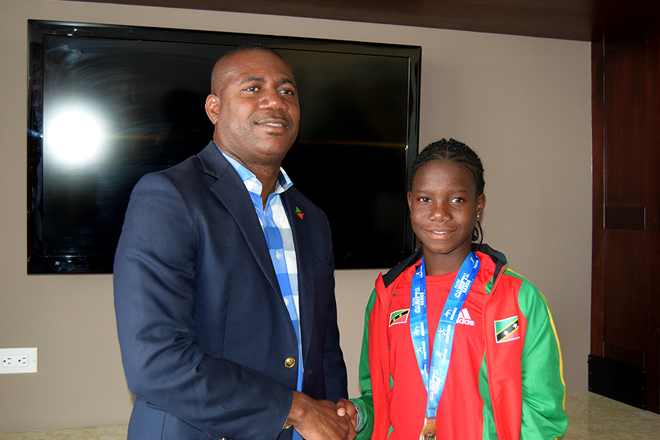 This includes one gold medal by then 13-year old Trishanni Warner in the under-17 girls 800m. In winning gold, Warner, who was one of the youngest among the 20 athletes who represented St. Kitts and Nevis, became the youngest person from the twin island Federation to ever win a CARIFTA medal. The team also took three bronze medals. The first came in the 400m courtesy national junior and senior record Holder Reandra Richards; the second by the quartet of Junior Rouse, Sharim Hamilton, Timothy Caines and D’Ateyel Stanley in the under-17 boys 4x400m, and the third by the under-20 girls 4x400m quartet of Reandra Richards, Jerencia Jeffers, Aliah Vanterpool and Nickeisha Howe. 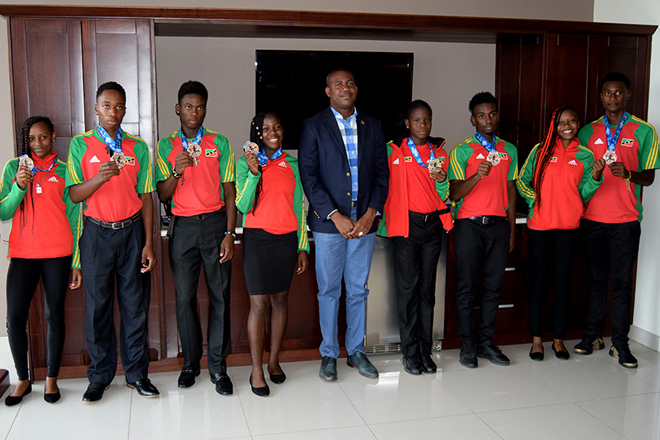 In congratulating the athletes and officials on their successful campaign, Minister Richards said the twenty athletes went out and proved to the wider Caribbean region that our spirit and determination are much greater than the size of our islands. “Last week when you left here and I spoke to you, I said to you to go out and do your best. I also said to you that yes, you are coming from the small twin island Federation of St. Kitts and Nevis but do not allow that to deter you. Obviously you did not allow that to deter you in that you have come back victorious in several different ways,” Minister Richards stated. While noting his appreciation to all the athletes who competed at the meet, the Sports Minister singled out and paid homage to the young Trishanni Warner on her outstanding performance in the under-17 girls 800m event. 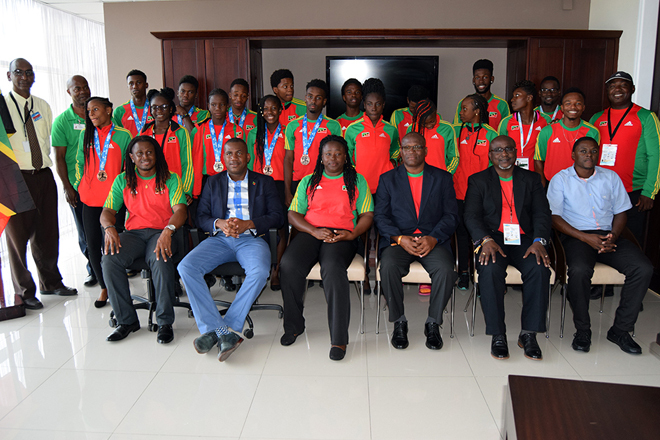 President of the St. Kitts and Nevis Amateur Athletic Association, Mr. Val Henry, used Tuesday’s reception ceremony to again thank the St. Kitts and Nevis Government for the support it provided to the athletic association. The government provided a grant valued at EC$50,000 to help offset the cost of sending the team to the Bahamas to participate in the games. A total of 20 athletes, three of whom are based in the United States of America (USA), and four officials represented St. Kitts and Nevis at the 47th edition of the CARIFTA Games from March 30 to April 2.